By Kevin Cochran. Kevin is a Strategic Partner Solutions Architect at AWS. Imagine what it would be like to write your web application, deploy it, and be done. No servers, no networking—just the excitement of coding and delivering. Now that’s a developer’s paradise—full control over all of the parts needed to do just that! Yet, in today’s complex world of IT, bringing all the parts together to make this possible doesn’t always feel much different than putting together a puzzle. There are thousands of different services, and sometimes it can be a little daunting assembling them to make your application sparkle. It’s now more common place—maybe even expected—for technology organizations to use best-of-breed tools from a number of sources to create an experience like this. But how do you choose? We’re glad you asked! As CIOs make digital transformation a priority and take advantage of moving to the cloud, one trend has become clear – more and more companies are working together to offer their shared customers a better experience. From simplifying and expanding customer engagements with high-impact results to running your IT infrastructure and resources with confidence, Salesforce and AWS are committed to helping tackle the challenges common to today’s business. With the combination of Salesforce and AWS, IT and business stakeholders have access to solutions that can help them provide a superior level of service to their customers. 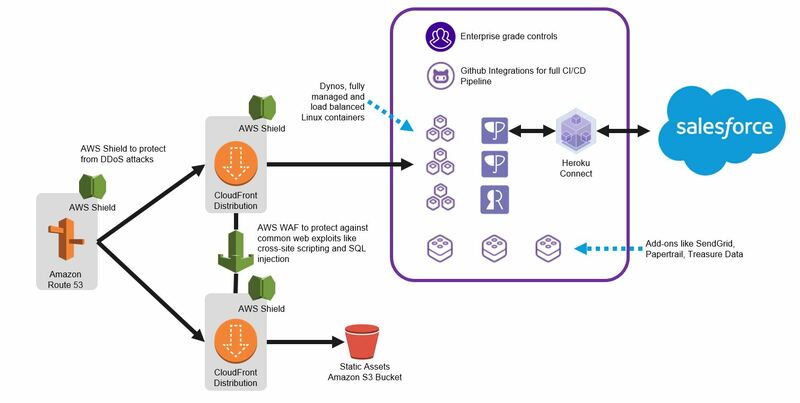 AWS and Salesforce Heroku work together to help customers make sense of it all and simplify the processes needed to make your application successful. With the added value of collaboration between these organizations, the combined services complement one another, resulting in a unified solution. In particular, the Salesforce Heroku platform enables developers to build, run, and operate apps entirely on AWS. By running on this platform, customers take advantage of many AWS benefits, such as scalability, security, and high availability. And Heroku customers can also more easily leverage the power of AWS services, such as data stores, analytics, machine learning, telephony, and more. Today, we’ll show you how running Salesforce Heroku on AWS can save you time, as well as provide tremendous value to your customers. The best way to illustrate this solution is with a practical example. Walking through a simple Heroku web application is probably the best place to start to illustrate how this solution can benefit you. Combining a handful of AWS services, such as AWS Shield, Amazon Route 53, and Amazon S3, with Heroku to manage your contacts in Salesforce can be set up in a relatively short amount of time. Let’s take a quick look at some of the components we’ll use to make this happen. In this example, Amazon Route 53 is directing the main application traffic to the Amazon CloudFront CDN in front of a Heroku app, while directing requests for application assets to the CloudFront CDN in front of Amazon Simple Storage Service (Amazon S3). We’ve created a Web Application Firewall (AWS WAF) rule, which is used by both CloudFront distributions (the application and the site assets). The Heroku application delivers the requested data, but you may also have it write customer information to your Heroku PostgreSQL database. Using Heroku Connect, the data can be transformed and transferred directly to Salesforce, where you can easily manage your customer data. Heroku Connect can keep your data synchronized. Learn more about Heroku add-ons here. Each of the components are simple to use and set up, and this scenario could be a great way for you to get started. Let’s take a look at each one of these in a little more detail. AWS Shield is a managed Distributed Denial of Service (DDoS) protection service that safeguards web applications running on AWS. There are two tiers of AWS Shield – Standard and Advanced. All AWS customers benefit from the automatic protections of AWS Shield Standard, at no additional charge. Amazon Route 53 is a highly available and scalable cloud Domain Name System (DNS) web service. Using Route 53 as your DNS service, traffic can be directed to different destinations based on the address. For instance, www.yourapp.com (http://www.yourapp.com/) can be directed to a Heroku application while static.yourapp.com (http://static.yourapp.com/) can be directed to an Amazon S3 bucket containing images and other site assets. AWS WAF is a web application firewall that helps protect your web applications from common web exploits that could affect application availability, compromise security, or consume excessive resources. You can use AWS WAF to create custom rules that block common common attack patterns, such as SQL injection or cross-site scripting. Rules can be created to allow or deny traffic matching certain patterns. You can deploy AWS WAF on either Amazon CloudFront as part of your CDN solution or the Application Load Balancer (ALB) that fronts your web servers or origin servers running on Amazon EC2. Amazon CloudFront is a global content delivery network (CDN) service that accelerates the delivery of your site’s content by caching the content. Edge locations are located globally. Using Salesforce Heroku, your application runs in containers called Dynos. These containers hold all the necessary libraries for your application, and the scaling for your application is managed by Heroku. Heroku also provides integrations for full CI/CD pipelines. The fastest and most convenient way to deliver content from Heroku to Salesforce is using Heroku Connect. Heroku Connect effectively transforms the data stored in your Heroku Postgres database, connects to Salesforce, and transfers the data. It provides two-way functionality, so updates to Salesforce can be reflected in your Heroku application. With AWS and Salesforce Heroku you can do more for your business and customers. From securing simple dynamic applications to processing big data, we can help you find a fast path to the solution you need.